Progress comes from your growth and development plan, not from your strategy. Hoping, wishing and praying doesn't work. Just trying harder doesn't work. 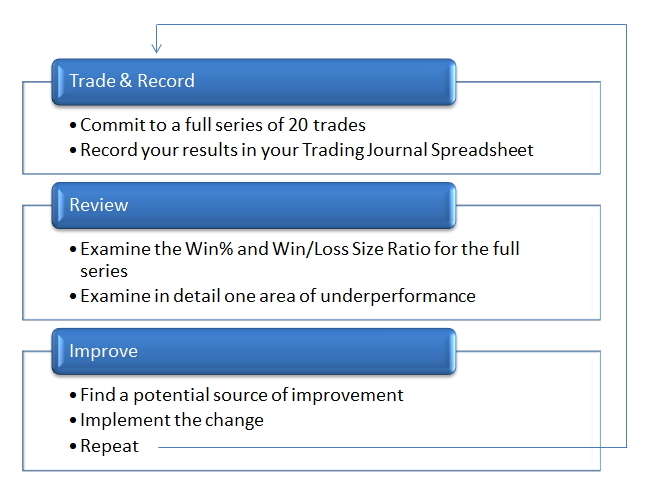 STEP ONE: Implement a growth and development plan based upon GROUPS OF TRADES. Also… any changes you're making… consider making them the stretch goal for your next group. Most importantly, major process changes can only occur at the end of each group. And they must be based upon proper review and analysis of your group stats and journal entries. STEP TWO: Intra-group, monitor daily to ensure consistent implementation of your process. No major process changes occur here. Only tweaks or minor changes to how you execute your processes. Now move the response to question three to tomorrow's pre-session planning. If you're not progressing, then something HAS TO CHANGE. Between groups, you MUST identify a concrete, actionable improvement to process. Within groups, you MUST monitor consistency in implementing process, and tweak as required to improve implementation. Hoping, wishing and praying that somehow this time it will be different, doesn't work. Just trying harder, doesn't work. Find something REAL that you can implement. It won't always be easy. In fact it will rarely be easy. But damn it, you can't progress by just continuing on the same treadmill. Fight to find an actionable change that progresses you in the right direction. Implement it. Repeat. When you say a full series of 20 trades of just one setup, for example 20 BOF setups? 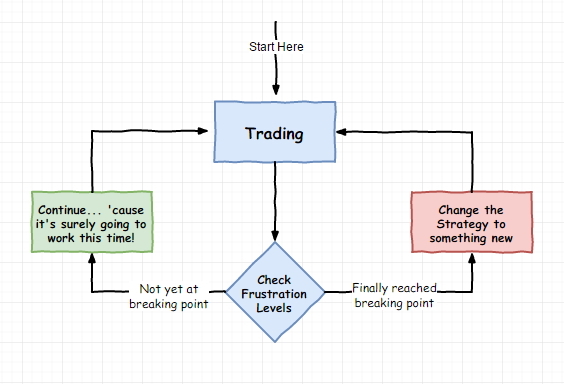 Or are you talking about 20 trades of any setup, as long as you are trading in structurally-sound locations? As for the 20 trades, I was referring to 20 trades regardless of setup type. However, if you want to split them into 20 trade groupings for each setup type, then this is EVEN BETTER. Go for it. It’s just a little more work, but will really improve the quality of the data that you’re looking at. Also, please note that the number 20 is just the absolute minimum I consider necessary to start to get some statistical significance. We need to find a nice balance between (a) having enough trades to ensure our sample size is statistically significant, and (b) occurring often enough that we get regular feedback. So more is better. If someone does 40 a day then they might want to increase the group sizes up to say 100 or even 200. But for everyone else, 20 minimum.